I've never been particularly crafty, but making something in a blazing inferno was something I had to try, even if I only made a cheesy paperweight. 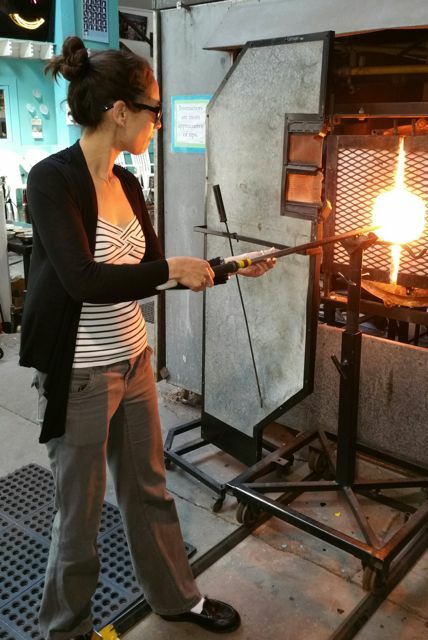 So when I read about the two-hour short course offered by New Orleans Glassworks I knew it had a place on our itinerary. 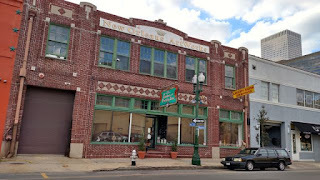 I tried contacting New Orleans Glassworks prior to flying out there with no luck. Luckily, the day we stopped by they had time available. Our instructor (Kyle) gave us thorough instructions and made things both safe and fun. At no point did I feel like I was about to burn off my face or any other body part. In the beginning, my technique definitely sucked, but it didn't blow! 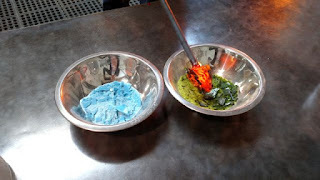 * We each made three items starting with a paperweight. 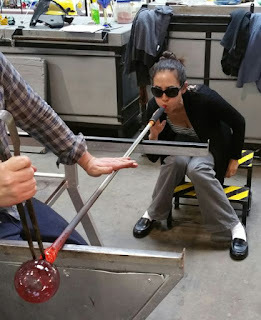 It wasn't until the second item that we actually did any glass blowing. 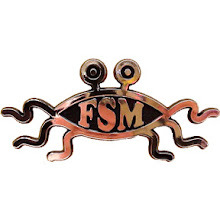 That said: the first steps were always the same. * You had to know a joke like this was on the way. 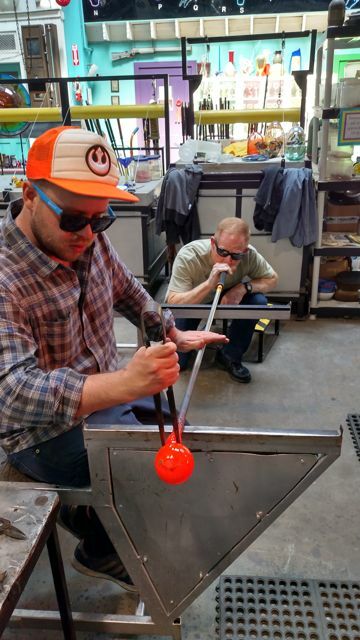 We started with a globule of clear, molten glass on the end of a metal pipe that Kyle "gathered" for us from the main inferno. 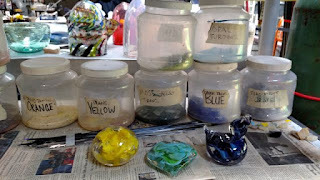 Then, we rolled the glob in one or more bowls of colored glass. The next step was to turn that spike-y collection of glass into an even blob. By exposing the hot mess to an intense heat source and turning, turning, turning, the room temp colored glass and molten clear glass melted together. The next step was to train the glass. For the paperweights, we used shears to introduce air bubbles (see image below). What you can't tell from the picture is what color the final product is going to be. When the piece cools, it will be the same green and blow shown in the bowl picture above. But while it's being manipulated, the color is red hot! The second piece we each made was an ornament. This is a beginner glass blowing piece because there isn't much to do to shape it. That said: Kyle was instrumental in creating the initial air bubble inside the glass. 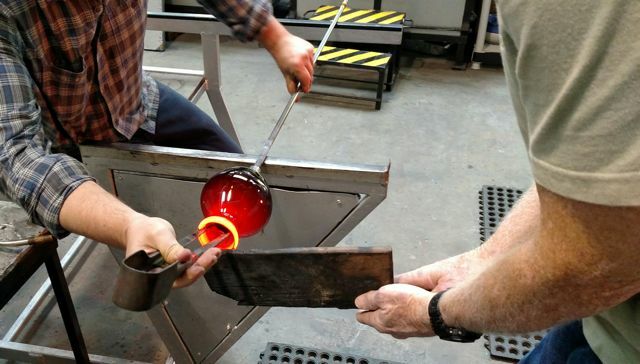 Getting a nice, even shape to grow within the glass is much more complicated than, say, blowing up a balloon. 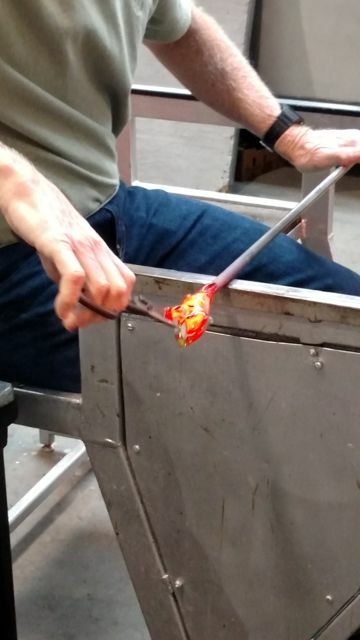 Also, real glassblowers can blow the glass and turn the rod solo. 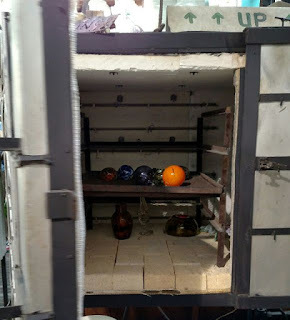 The two-person set-up below allowed us a chance to practice the act of glassblowing without a subsequent trip to the emergency room. Tom's third item was a vase. This required some shaping with a board and use of tongs to get a flat, even opening. 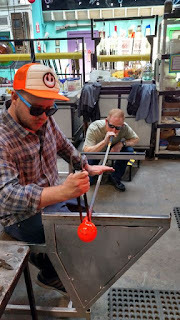 After the pieces were done, Kyle took them over to the "knock off table" where, using tongs dipped in water, we used water droplets to create (I think) weak spots at the connection point between the rod and the piece. A few droplets and separation was easy with a quick tap (or knock, if you will). 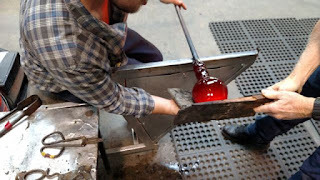 The pieces were then transferred to an oven that would gradually cool the glass from 900 degrees down to room temperature. This is called "kneeling." If glass cools too rapidly it can crack, or even explode. I don't have the final pieces yet. The New Orleans Glassworks staff takes care of polishing the items after the kneeling is done. They will be shipping them to America's Vancouver sometime this week!